Cross section of textures at the surface of superhydrophobic surfaces. Water is sitting at the top of the posts, so the contact area between the drop and the surface is effectively reduced by a factor Φ called the surface fraction. 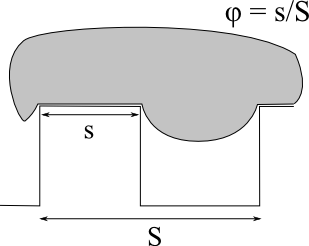 The real wetted area is s. The apparent wetted area is S. The surface fraction is Φ=s/S.